If you are a teacher, read on to find out how we can help prepare your pupils for the jump to further education. We’re pretty flexible so if you can’t find what you’re looking for, or want to tailor an activity to your school’s needs, give us a call. Sixth form? College? Work? It’s a tough decision for Year 11 pupils and can be quite daunting, especially with the added pressures of GCSE coursework and exams. We want your pupils to make the right decision about their future and have a team of experts on stand-by to make sure that happens! Led by our school liaison co-ordinator, Sian, our student advisers visit schools across the region to talk about college life and the different study paths available, answering any questions and concerns pupils have. If you want our team to pay a visit to your school, contact Sian. We know the transition from school to college can be overwhelming for some young people so we want to prepare them as much as possible for college life. 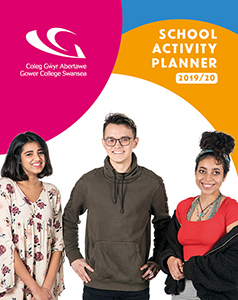 The team organise regular tours so your pupils can get a heads-up of what it is like to be a student at Gower College Swansea. And it doesn’t stop there! The team also organises taster sessions in different subject areas so that your pupils can see what the course is like before they enrol. View our School Activity Planner. Want to learn something different? Our 14-16 programme gives schools the chance to offer their pupils less traditional subjects as GCSE options, subjects that aren't taught at school. We've taught hundreds of 14 to 16-year-olds over the years in subjects that are geared up for specific careers, teaching skills that have been identified as key by the industry sectors themselves. So if you've got a pupil that's head strong on a career in hairdressing or revving up for a job as a mechanic, this is the programme for them. Interested? Contact Lynne Burrows or download the prospectus. The more popular subjects include engineering, digital technology, hospitality and catering, hair and beauty and motor vehicle but we can offer any subject if the demand is there.